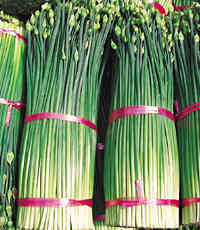 Chinese leek flower can be considered a delicacy in chinese cuisine. It belongs to the same family as onions and is highly nutritious and sweetly flavoured. Usually, the “flower” is eaten before it blooms. A secret to good tasting leek flower is to remove the “skin” very carefully from the stem. This layer of “skin” is as thin as cling-film and takes some practice to remove them. Try not to use a knife as you will remove the outer-layer of the stem instead. Once you have removed the transparent looking “skin”, you are on the right track. I usually cook the leek flower with beancurd (firm type), prawns and carrots. You can also throw in roasted pork for added flavour. 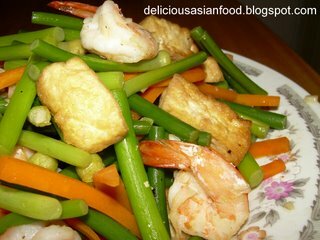 This is my recipe for Chinese Leek Flower with Beancurd, Carrots and Prawns. Heat oil and fry garlic for 15 seconds or so. Add leek flower, carrots, prawns and pre-fried beancurd. Stir-fry till prawns are cooked. Add seasoning and warm water and close lid. Cook for another 3 to 5 minutes. Add a little bit more water if the dish dries up. If you want to add roast pork, chop the roast pork (amount up to you) and add it into the dish before seasoning. You might want to reduce the oyster sauce because roast pork can be a bit salty. so hard to remove the outer layer of the skin >.< i got fed up, and quit lol!